It is dark. A light rain has fallen onto the seemingly black and shining street. It is early-morning quiet; no humans disturb the blissfully sublime silence – as so many disturb the peace of evening with their self-serving ramblings. Night fell along with clear perception long ago and the bustling movement of the herd has left its daily mark upon the earth without gratitude or empathy, but common human thankless utility. The air is as calm and soothingly still as the ground appears. It has been a peaceful evening in stark contrast to the tumult of the one previous — Mother’s show of force in the form of a thunderstorm. Thus this night is little more than quieting. It is of a deeply dark yet clear blue hue, one of those evenings when it is both easy and difficult to discern at what one is looking. In the clear of the few clouds numbering the heavens can be seen an object, just barely recognizable as some thing. Its brilliant yet elusive movement through the ether gives it a mystery both secular and divine. As yet peering at the object one notices little more than that it is some thing. One may at this time discern that it is oblong and cylindrical, but not that it has the movement normally associated with existence; it may not yet exist. Its colour is deep black – a hue so constituted to denote the sleekness of amphibial skin. The deep blue sky and the dark skin of this thing in a manner combine. The blending of skin and sky, we think, is partially what makes the object so difficult to observe. It approaches the beginning of movement and we notice that it has vanished – beneath or above the small cloud near it we cannot tell. We wait one moment, transfixed, and again it is there. It must have substance we assume because the cloud was its cover. But now as it is nearer we may comprehend more, and we notice that it is more and yet less than the form we last perceived. It now has grown in manner of being. It has projections about it, as if beyond the realm of perception it has gained appendages. For now it has grown a set of arms and is small of legs. At first these appendages seem to move with that unequalled grace signifying life. Then we notice that they have ceased movement, simply project from the thing. Still, we do not yet know what it is. When we once again peer at the object it has changed in turn. We notice now that its being has come to a delightfully clear fruition. The arms have flattened as if made of durable yet flexible steel. It retains its cylindrical shape yet the organic quality of the body of the thing has ceased. The legs have become short and squat, jutting slightly towards the posterior of the thing. Where there might be eyes we vaguely discern windows. Its colour has lightened to a middle grey and it has become unresponsive, as is the manner of inanimate objects. Yet it lives. 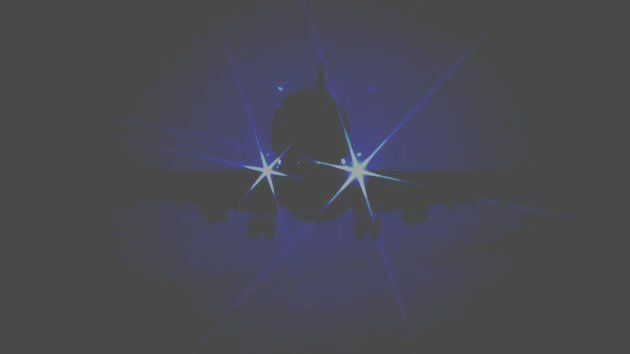 We see in it the utility and the hard steadfast quality of an airborne machine in flight, now comprehend the blinking lights of an aircraft. We relax and wonder what has troubled us about such a mundane object. Surely something so common cannot give us the slightest pause; we know so much about these human inventions. They are our creations, these — still, something in this object permits us no other thought. We make an attempt to clarify our question, ending in failure. Perceptive though we may still be, we have not yet recognized that it has made no sound, and will continue its journey in complete silence. We cannot say what makes this silence divine, but we do come to understand, apparently through intuition, that it is yet alive with voice. The voice comes from the craft as if it were living and the craft makes these sounds with disturbing spontaneity: it remains silent and yet undeniably sings. It sings to some an old religious chant, giving life to clay. To others it sings the melodious stringings of a finely tuned harp. Others, sadly, cannot hear the voice of this machine which lives. Perhaps the aircraft's manifestation is the effort of some old god attempting to taunt us into humility, possibly stating that if an object so divine should exist, it would exist in a silence so constructed. Such voice would be the sound man longs to hear and it would permit no mortal creature to listen to its truth. It would be one of humanity’s greatest mysteries. But for the great distance from our position on the ground we might decide to touch the craft with a digit, to dubious result. Would such a craft permit touch? If one should be capable of being within close proximity to the machine, one would have second thoughts about the attempt. So awesome is the notion of the craft. One would hope that a touch would clarify the craft’s substantiality. Yet, we may again intuit that touch is not here possible. For the craft will not subject itself to the vulgar probings of man. It seems man may think the craft, even see it, but not touch it. We sense also that should we contain the craft in some manner and attempt an experiment the craft would disappear, not permitting itself to be offended in this the corporeal manner. It is as far away as the heavens, and as close as the mind. And if we were capable of touching this object of desire, we might make attempt to embrace a machine that is both nothing and everything. Possibly, it flies the heavens where no man may reach his feeble senses. Still we try. Now that we have come to comprehend the craft in dubious fashion, we notice that its volition is peculiar. It does not move in that apparently slow and graceful fashion that characterizes modern airborne craft. Yet it does not move with jerks or abrupt leaps. One could say that it is not moving at all, and yet we sense in it a motion. It has changed and therefore must have moved, but we cannot say that its movement is of the ordinary case. Still, we understand that the craft moves and will continue moving for longer than man lives, longer than time itself. Possibly its movement is ontological in nature. Possibly its volition lies beyond the realm of experiment and knowing, beyond the realm of becoming. The craft possesses form and yet no form. It defines itself with the April grace of beauty’s power. Its movement defines and clarifies only for a moment. Thus we cannot determine what type of aircraft it is or whether it has purpose or destination, cannot even determine that it is divine. This moment of our perception of the craft is one steady second and eternity. It is all at once everything, allowing it to be nothing. For intuition dictates, once more, that the beautiful has played an integral part in this act. What gives this craft its curious nature is not its ability to defy the laws of nature and therefore the imposed realm of human volition, nor its strange substance or bizarre physical attributes, but its appearance in the heavens as a ship of exceeding weight – as if with an exalted cargo. Something which should not possess the ability to remain airborne, yet accomplishes the task with a decided ease. It is not even its weight and weightlessness that leads us to believe the craft has a sublime mission, but that the craft is itself without pilot. It is not clear how we know, as one can only discern the ship from the ground; yet intuition dictates we make the assumption. It is also evident in perceiving the craft that it is not of human design and decidedly, almost frighteningly, ancient. Still, it is of recent human invention, truly a curious observance. It has flown the heavens for longer than millennia may imagine. Exactly what cargo it may contain, if it contains any at this late period, is undeniably uncertain. We come to expect, with arrogance, that within lies the human secret. It is that which we have come to know as the beautiful, the sublime permission of creation. It is that which allows any thing being. It is from within existence. And seemingly, it is incipience. And it is not even the aircraft’s state that leaves the more perceptive of spectators gawking, but the undeniable truth that the ship is clearly alight with the brilliant hues of red and yellow, signifying not only beauty but the great and hideous nature of destruction. For the aircraft is afire. And why should a craft like this not be dying? Destruction within creation. Not only is the aircraft in the throes of destruction, but if it should abruptly cease this apparent chemical consumption, one would more clearly discern that it is on the steady decline leading it away from the heavens onto terra. In short, it is flying in slight gesture steadily downward, on a decline towards an oblivion more substantial than the earth and yet not at all very terrifying, as would be the case if it were an ordinary aircraft. The oblivion this craft heads towards is its own true being and the consumption of the craft by flame almost gives us a sort of relief; death is the last great relief. Is it not? We know then that the craft will not hit terra, yet it declines towards earth with no apparent destination. As we understand that the craft has no true destination, we also come to believe that it is not a craft at all but something infinitely more enduring and though it is aflame, its cargo will not be damaged. How and where did this fire ignite? The pilot may know, yet the pilot is absent. Some contend that he has abandoned us in his wisdom; others believe that he was never present; still others hold that his presence or absence is moot. But does this not mean that the craft will not be? We only state yes, and yet no; we do not know. We sense the loss of the craft would not weigh so heavily on the infinite as it would upon us; it is we who have created this machine and it is we who use it; we take sole credit for its invention. So arrogantly do humans claim rights of divinity ontology verity, as if this object had no potential without man. If the craft could laugh it would certainly find human arrogance amusing. Maybe our machine will discover means to do so, then take delight in our absurdities. The thoughts of man here are like the shadows thrown onto a wall made possible only by the brilliant light of verity ontology divinity. And this craft is beautiful, itself making possibility. So truly is the aesthetic realm the giver we think, so little we know of that which permits. The craft possesses no time in the sense that it has existed longer than the first thought. It moves not through moment, but truth; we say again that it will never reach terra. We come to fear that if this craft should truly cease existing, so would also the entirety of being, and it is a vessel familiar only because we have existence; its being comes from beyond. As we have peered too long at the object and its form is still a mystery, we pause to relax our corporeal form and rub the eyes through which we understand, possibly napping for as long as it takes to strain again the cogito. When we awaken, or possibly one moment later look again, we see something that simply astounds us. We notice once more that the thing has come alive. It moves as would a tiny frogling – just barely not a tadpole; neither this nor frog. We strain eyes and look for what it was and find no lights of craft nor the jutting appendages known as wings. It now resembles more the slinking feline or the edgy mineral. More we cannot determine as what seemed to be the craft fades into the space where it first began. When we find ourselves once again peering into our own, now seemingly mundane, existence we find that others have perceived the same object. Some contend that it was first a fish and then a zeppelin. Others say it was first a bear and then a balloon. Some believe it was maya or illusion. We notice that few have perceived the craft, yet enough to substantiate its existence. We notice also that fewer still of these few continue to cogitate over the phenomenon. Still, the few who remain immersed in the mystery do agree on one thing. All are in perfect agreement that the craft was beautiful.